This sweet-sounding speaker is built to satisfy the music lover, and it's outfitted with high-end features you don't typically see at this price. Speakers powered by smart assistants are becoming dime-a-dozen commodities. In most cases, a smart speaker is good for voice commands, but I haven't found their musical reproduction particularly satisfying. Riva Audio's Riva Concert changed that for me. The Riva Concert is part of Riva Audio's new Voice line of smart speakers that also includes the larger Riva Stadium. But the Riva Concert isn't just another Alexa-powered gadget. This sweet-sounding portable speaker is built to satisfy music lovers, with refined high-tech features you don't often see in smart speakers. Unpacking the Riva, I noted its heavy, solid build. There's nothing cheap or flimsy about the Concert. Under the hood, you'll find a 50-watt Class D amplifier powering the three active drivers and three passive radiators. The Riva Concert is beautifully designed. From a distance, I could see where one might mistake the Concert for a Sonos Play:1. 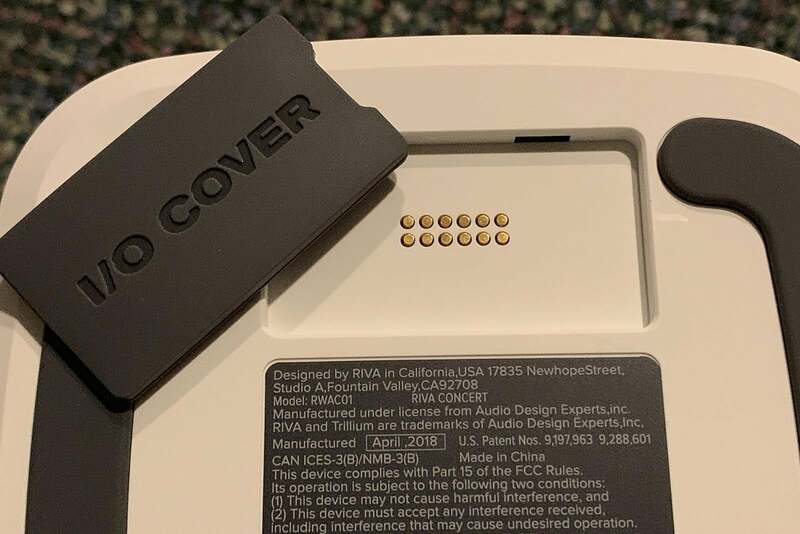 The Concert’s silver metal grille wraps around the entire unit, sandwiched between white (the color of my review sample) or black top and bottom caps. The speaker is sleek, smart, and built to blend into any decor. The Concert sports five large and clearly marked buttons arranged in a circular motif on the unit's top. Riva says the touch-sensitive control buttons are splash-resistant, which will handy if you use the device in the kitchen. The four buttons encircling the perimeter are for volume up/down, and next/previous song. The “previous song” button doubles for forced wireless pairing, and the “next song” button switches the Riva’s inputs. Inputs are located on the back directly above the power cord. Riva Concert's physical control buttons. 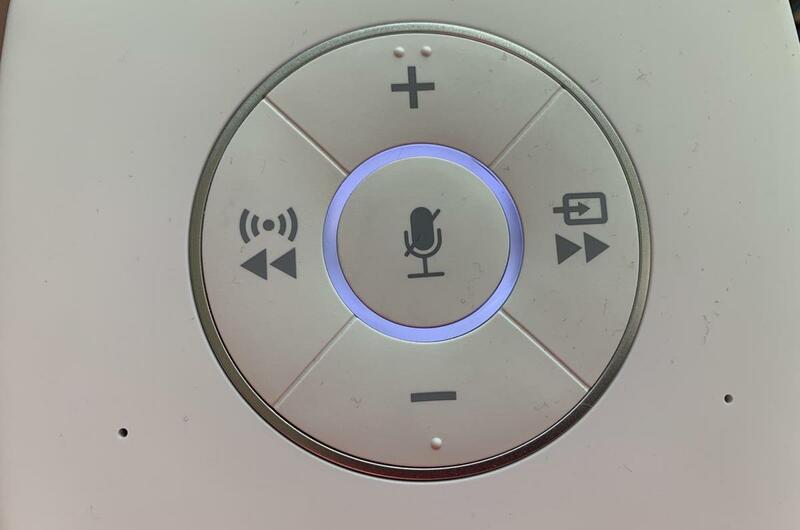 The inner ring around the Alexa privacy (mute) button is an LED that glows different colors to indicate which mode the speaker is in. White means the Concert is connected to a Wi-Fi network, or that a USB device is connected for playback. Green indicates Spotify Connect is engaged. Blue means you're streaming from a Bluetooth device. Red means you've selected the AUX input. And yellow indicates Direct Connect Wi-Fi. There’s a 3.5mm analog aux input for feeding an audio signal from a smartphone, tablet, or digital audio player. The Riva Concert’s USB charging port functions for both audio in and power out to charge your smart device. The Concert is smartly designed for your bedside table or on-the-go use. I loved being able to use the Riva as my primary charging station to eliminate clutter. A detailed view of the Riva Concert's inputs. The USB port doubles as a charger for smart devices. Look closely, and you'll see a switch on the back with house and airplane icons. This switch puts the Concert into "home" mode, where it will connect to your home Wi-Fi network, or in "away" mode, where the Riva creates its own peer-to-peer Wi-Fi network. 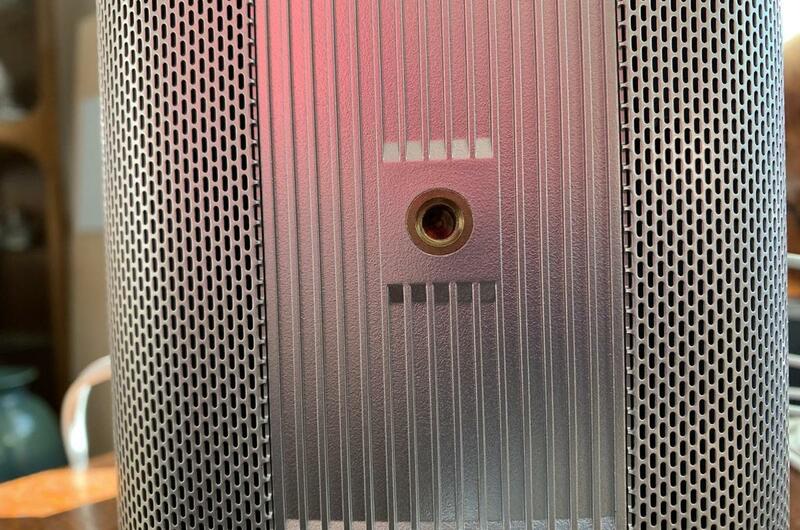 You'll also notice there's a threaded opening on the rear that's compatible with common speaker mounts that use 6mm screws. The Riva Concert is compatible with 6mm speaker mounts. You can summon Amazon's Alexa digital assistant with voice commands that are picked up by the Riva Concert's three high-performance, echo-cancelling microphones. The Concert worked like any other Alexa-powered speaker I've tested. I could ask Alexa questions, check the weather or news, play songs, and take advantage of whatever skills I've loaded in my Alexa profile. Of course, the Concert worked just fine with other Amazon speakers in my home with popular features like “Drop In” for in-house intercom and whole-home broadcast. The company says it has designed the Concert with an open architecture and enough onboard memory to handle future Alexa enhancements. Alexa’s volume is independent of the main system volume—something I loved in real-world testing. Even if I had the Riva Concert blasting in my house, if I engaged Alexa, she would respond in a normal speaking volume as opposed to responding at the same high volume. 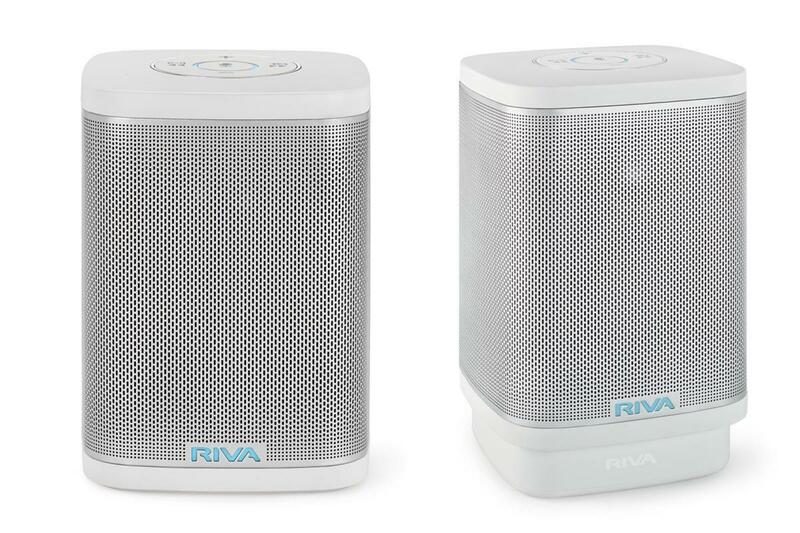 Compared to the Amazon Dot speakers I have, however, I noticed that the Riva Concert had a slightly longer delay in responding. The Concert is also compatible with Spotify Voice, so you can use voice commands to control Spotify. Those who have privacy concerns about Alexa always listening in can press the large circular button on the Riva Concert’s top to mute the microphones (the Riva in front glows red to let you know the mics' status). The Concert features Riva's Trillium audio technology, which the company says enables the speaker to deliver immersive stereophonic sound from a single box speaker. As I noted in my earlier review of the Riva S Bluetooth speaker, Trillium creates a 300-degree sound field by distributing a stereo signal across the Riva’s drivers mounted on the unit's three sides. Riva claims that the Trillium design creates the psychoacoustic perception of a wider stereo sound stage and coherent timbral accuracy, even as you move off-axis. I tested the Riva in both my basement theater and my living room, and sure enough, the Riva created a soundstage that was far wider and richer than you'd expect—although you shouldn't expect the Riva to take the place of a conventional two-channel speaker system. This Riva Concert cut-away view shows its active drivers and passive radiators. The Concert is designed to be used with the Riva Voice app for iOS or Android. Setting up the Concert via the app was easy. Riva has done an exceptional job with the step-by-step process. The Riva Voice app makes it easy to set up the Concert. 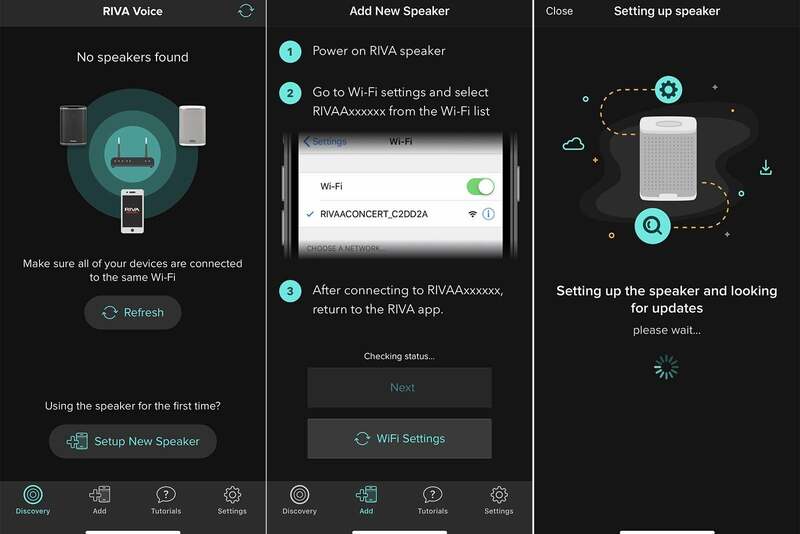 The app is your one-stop dashboard for the speaker's rich feature set: You can browse compatible Riva Voice-series speakers on your network, set separate volume settings for Alexa, check the charge of the optional battery pack, select music source inputs, check the unit's network settings and firmware, and adjust audio output and bass/treble EQ settings. You can also configure the Riva's "away" mode here. Should you take the Riva on the go and discover there's no Wi-Fi network available, you can configure its built-in peer-to-peer Wi-Fi network and stream music to the Riva with all the reliability and bandwidth of Wi-Fi. 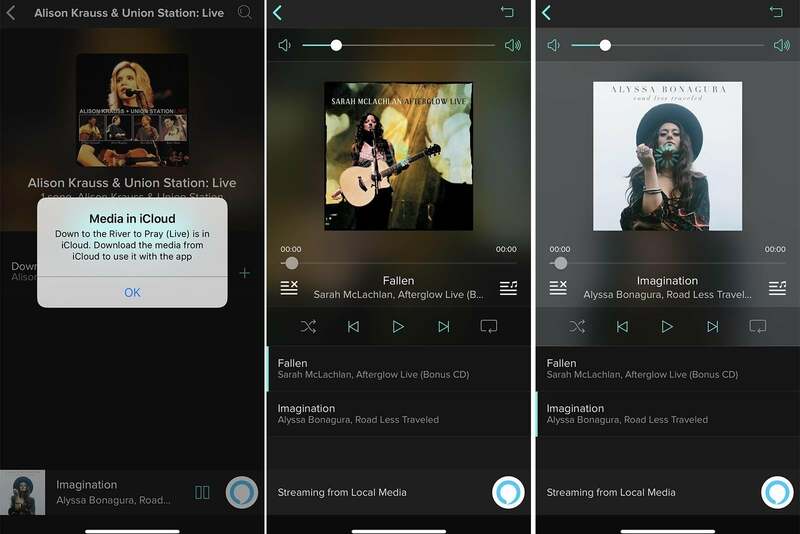 You can easily play music from your smart device, DLNA compatible music server, USB connection, Spotify, Bluetooth, or 3.5mm AUX input. The Riva supports Apple's AirPlay technology as well. If you have high-resolution music files, you'll be happy to note that the Riva will support high-res audio files up to 24-bit/192kHz when using the Riva Voice app. You can browse your entire music collection via the Riva Voice app. 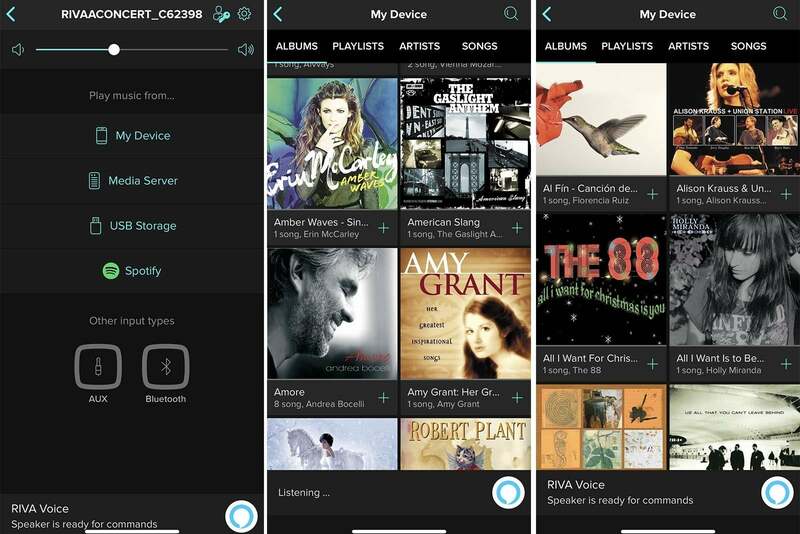 If you want to play music from your smartphone or tablet library, however, it must be downloaded to the device to play via the Riva Voice app. On my iPhone XS, the Riva Voice app showed all the music from my Music app. Experienced users, however, will know that even though music shows up in the Riva app, you won't be able to play those songs until you physically download them to your device. The Riva app likewise won't play downloaded files that are locked—such as those you might have with an Apple Music subscription. In cases like that, you'll need to use AirPlay instead. The app lets you take advantage of a feature called Riva Voice. 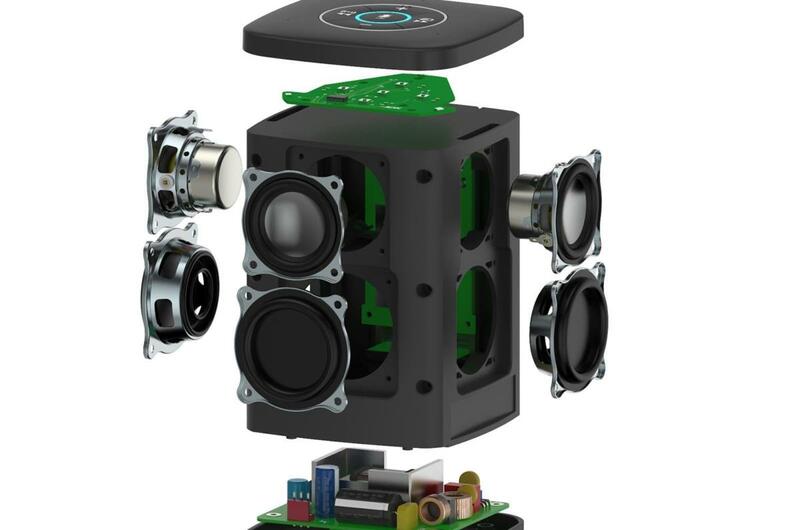 When the music is playing or in loud noise environments, it's sometimes tough to get a smart speaker to respond. Simply press the Alexa logo on the app, and it will automatically engage Alexa, pausing any music that might be blasting out from the speaker. Riva says this feature is also useful in loud party settings. If you purchase multiple Riva Voice-series speakers, you'll be able to stream music to speakers throughout your home with a multi-room feature that Riva will be releasing as a free over-the-air update. Riva has put an end to the need for separate smart and portable speakers: The Riva Concert can do both. The optional battery pack that Riva provided for this review turns the Concert into a portable powerhouse. When used with the aforementioned "away" feature, the Riva Concert takes on a whole new value proposition. The battery is rated to deliver around 15 hours of juice if you play the Riva Concert at 75-percent volume. The Riva battery pack is a snap to connect. The square battery pack attaches to the bottom of the Riva Concert quickly and easily. Simply remove the rubber gasket to expose the charging port, snap in the battery pack, and you’re done in mere seconds. So that you don’t lose the rubber gasket, the battery pack has a place for you to store it. Smart. To unlock the battery, press the button on the back of the unit and bingo, it slides right off. 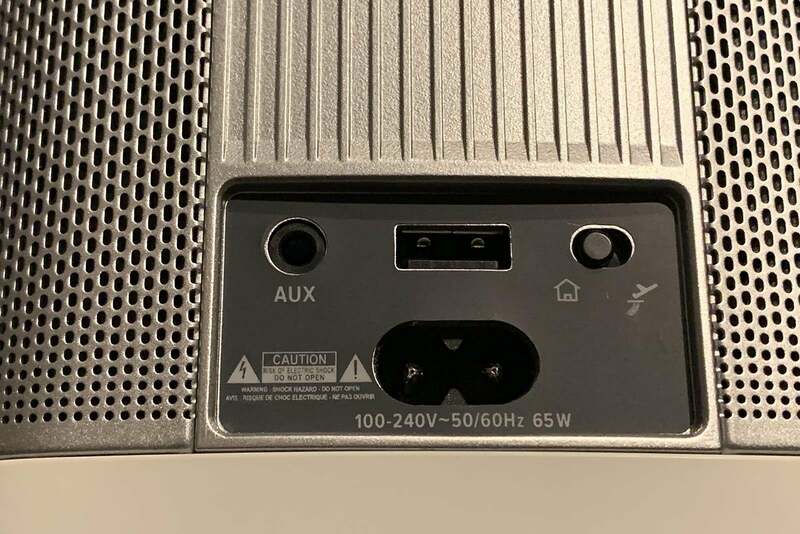 I have a few observations about the battery pack’s design: first, it’s smaller than the base of the speaker, which initially made it look a bit odd. You might not agree, but I prefer to have a battery pack that matches the speaker’s footprint. Second, I could dislodge the battery pack if I pushed it from the front—even when it was locked in. Lifting the rubber gasket exposes the Riva's battery connector on the unit's bottom. I dislodged the battery pack consistently with a good push every time. There might be a rare case where the battery pack could come loose when you’re transporting it if the base is subjected to a front-to-back push. I don't think such a force will break the plastic hooks. I think it will just dislodge it. I’d like to see Riva redesign the locking mechanism. I played music via the Riva App, using Alexa to bring up songs via Tidal, and AirPlay connections from my iPhone XS via Tidal. 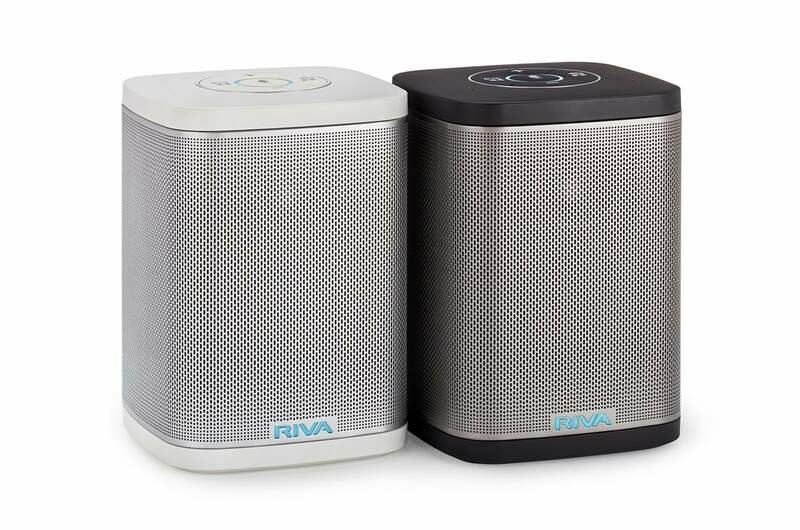 Simply put, the Riva is nothing short of a great-sounding smart speaker. 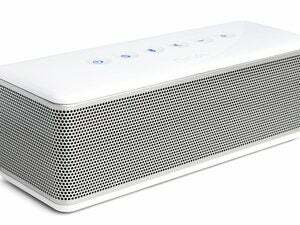 The Concert has a clean mid-range, a nice top end, and decent bass for a speaker its size. There's a noticeable boost in the mid- and upper bass that gives you a bit more of that "chest-punch" that I think most consumers will find euphonic in a speaker of this size. Via the Riva Voice app you can choose the Concert's various source inputs and browse music on your smart device or DLNA server. Playing Imagine Dragons' Origins, the Riva engaged me with every track. I liked the Riva's ability to convey musical energy and dynamics on songs like "Natural," "Boomerang," and "Zero." The speaker's bass limitations were apparent on "Machine" which has a some deep, impactful bass that you can only truly appreciate with tower speakers or a powered subwoofer. If you're accustomed to listening to speakers of this size, I think you might immediately be drawn to the Riva Concert's penchant for musical clarity throughout the mid-range. On songs like the Revivalists' "Wish I Knew You" or "King of What," I didn't hear that overt veil over the mid-range, muddying up the music. Perhaps best of all, even if I cranked up the volume, the Riva remained distortion free. The Riva Concert comes in either white or black finishes. I loved my time with the Riva Concert. It's exceptionally well-built, sports a sleek design, offers a host of music input options, and is outstandingly portable. The Riva Voice app further enhances the unit's value proposition. 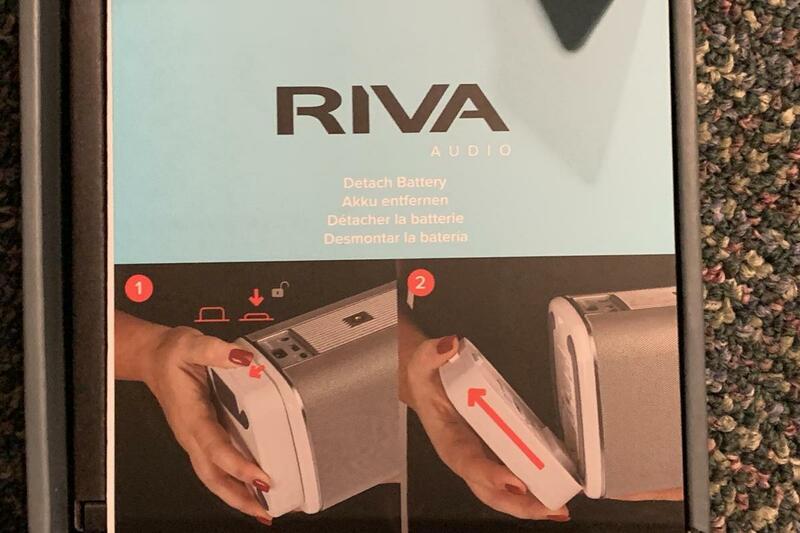 I had only two minor reservations with the Riva Concert: A somewhat delayed Alexa response (compared to my Echo Dot), and tendency for the optional battery pack to get knocked loose. Otherwise, I had a very positive experience using the Riva Concert. If you're in the market for a smart speaker that will elevate your music listening and give you some refined, high-tech flexibility, then look no further than the Riva Concert.